I just had to comment on the appearance of the rocker arm compartment; the oil looks strange, kind of crystalline. I've only seen smooth oil coating in this area but your rockers look unusual as if maybe water or steam is getting under the rocker cover. I will defer to others on the question of water or steam. 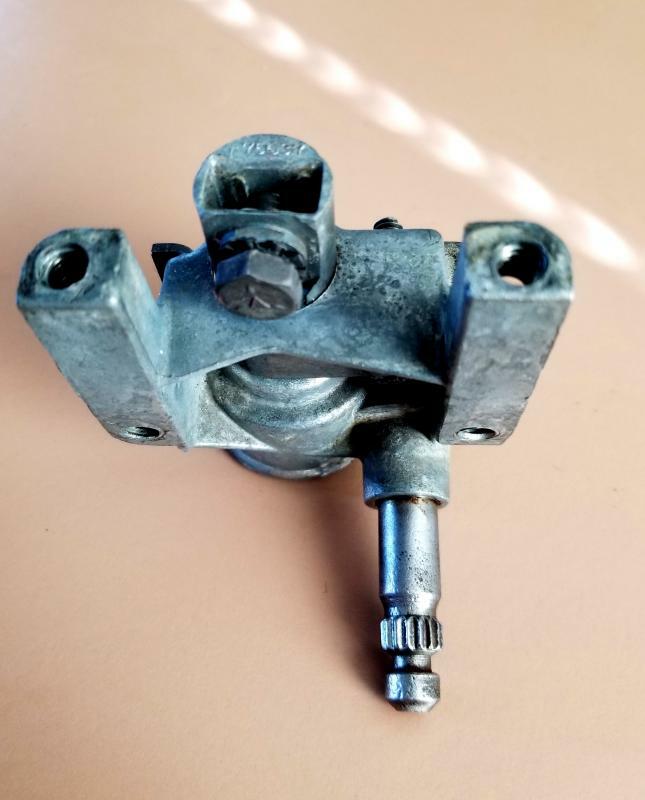 But in post #29, Don Micheletti noted the unusual appearance of the "crud" in my valve train -- more "cooked' and flaky, rather than sludgy -- and attributed it to the poor crankcase ventilation from the short-lived change in '41 to venting the crankcase through the valve cover into the air cleaner instead of using a road draft tube. This one year experiment is discussed earlier in the thread. I got the sound deadening material in the right rear door -- it makes a clearly audible difference. 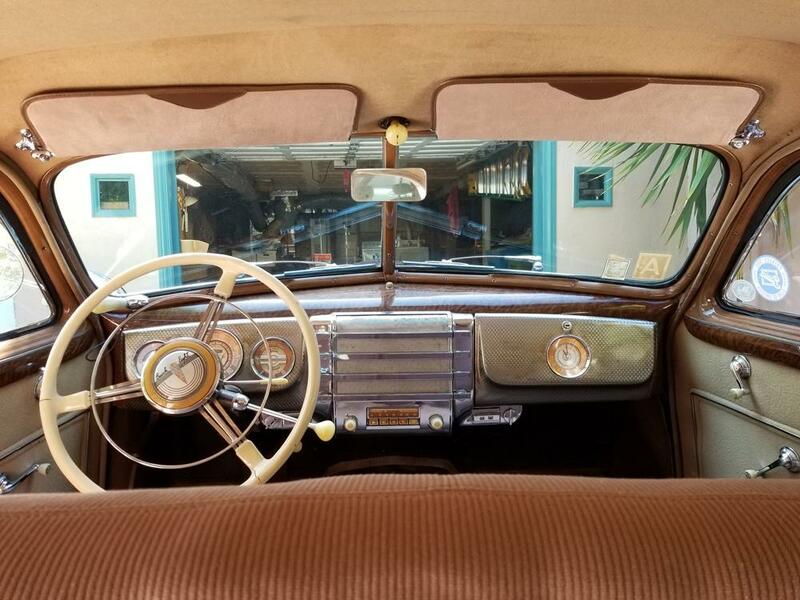 The door closes with a "thunk" instead of a "clang," and that's without the interior door panel installed. And then today I met with Grimy's friend, Gary, for a consultation on the problem with the door not fitting properly. Gary was able to adjust the hinges to raise the door up a bit, which took care of one problem. However, we determined that the upper part of the door is going to have to be "reshaped" (i.e., bent) to get it to seal properly. We tried to do it with a 2X4, but it required more muscle than either of us had. Gary took me down to meet Mike at a local body shop, who said he was pretty sure he could take care of it. So I will be going back another day to let Mike have a go at it. I also picked up my rear bumper, which Gary had sent out for replating at a very good price, and it looks beautiful. So a very good day! I am so grateful to the AACA for hosting this fantastic forum, which has enabled me to meet so many helpful and friendly fellow-enthusiasts! Before you put the door panel back on, may I ask what is the possibility that the sound deadner will absorb water? If any, I suggest you strip it out and live with the clang. I'd be overly cautious about creating a continuous wet blanket in a tough to vent compartment. Boy, talk about a wet blanket! LOL. The material sounds great. But I'd still take it out and here's why. I am assuming you are not going to run an air conditioner unit in the car. I also assume you won't intentionally take the car out when it's too hot/cold or wet. Under those conditions, I assume when you do take it out the windows will be opened. 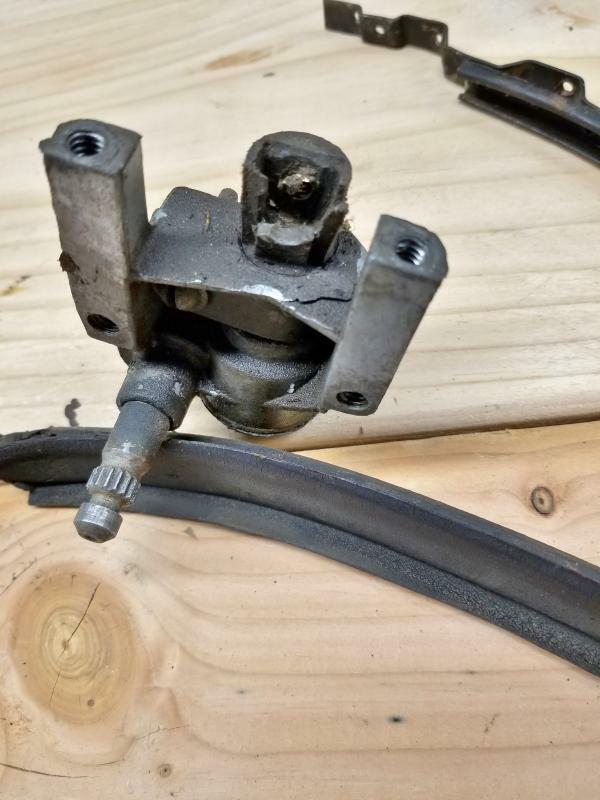 At that point what good is this sound deadener? It will have no value for it's stated purposes. But, lets assume you get caught in a rain storm or wash the car. Chances are pretty good the water will get past the felt seals on the door glasses. Subsequently water will enter the door cavity and hopefully drain out the bottom as designed. But now you've just insulated the door skin and thereby reduced the thermal efficiency of the sun to dry the innards of the door. Will it dry eventually? Yes. How long will it take? Unknown. And the longer that takes to dry the better chance the adhesive on the product could be affected. If it were my choice I'd spray the inside of the door with a rubberized under spray product after plugging the drain holes with a thin wooden wedge that can be removed afterwards. That will give one the same deadener quality if it is really needed. 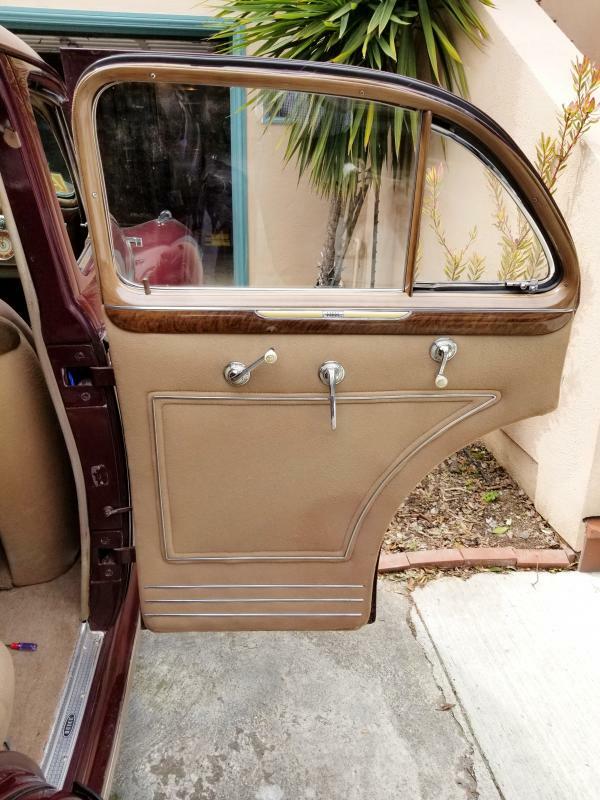 But I don't even think that's needed or desirable since the door is already two panels with a third upholstery panel, which seems more than adequate for sound deadening, and chances are the windows will be open anyhow. In the end though, it's not my choice. So carry on! The car looks fabulous! I think since the sound deadener is stuck to the outer skin and not piled in the bottom of the door it should be fine. As you say, it's not going to get that wet and if it does, it should drain down. This is what the factory did in an inferior way, and that pile of sound-deadener he pulled out of the door was probably more of a moisture risk than this stuff glued to the skin. 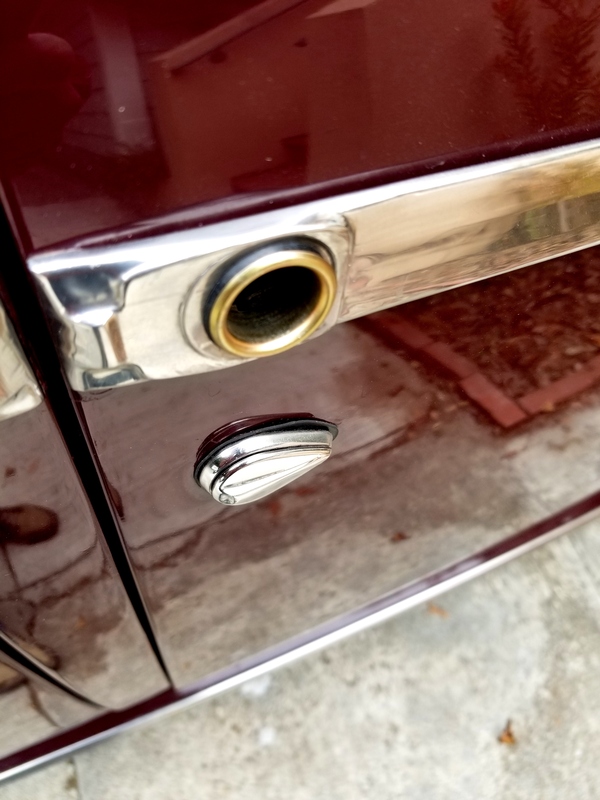 I'm planning on doing the same thing to my Limited, not necessarily to make it quieter at speed, but I don't like the hollow smack of the door closing--unbecoming of a limousine. My '41 Cadillac makes such a nice, solid CHUNK sound rather than a ringing WHAP. I am, however, investigating a spray-on coating to help deaden the sound. although it's hard to get inside a door like this. I like the ease of a glue-on panel, something that will attenuate the ringing of the outer panel rather than trying to make it quieter with the windows open. I think he's in no real danger considering how we use our cars and, as he points out, the stuff doesn't absorb water anyway. It's probably designed to work in these situations where moisture could be a factor. Based on my experience (at least with this particular product), I don't think it would be anywhere near as good to deaden sound in the doors as the stuff that I used. 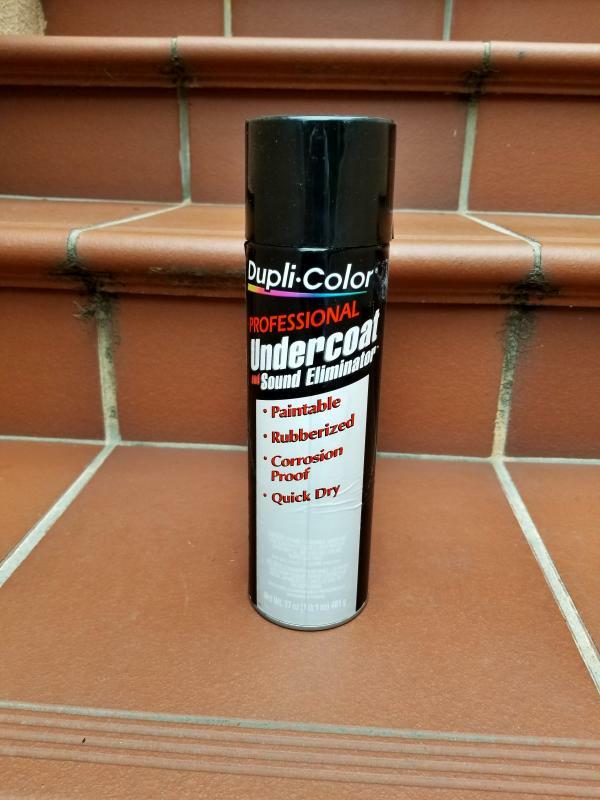 It's basically a rubberized paint that leaves a coating that's only about 1/8 inch thick, at most. 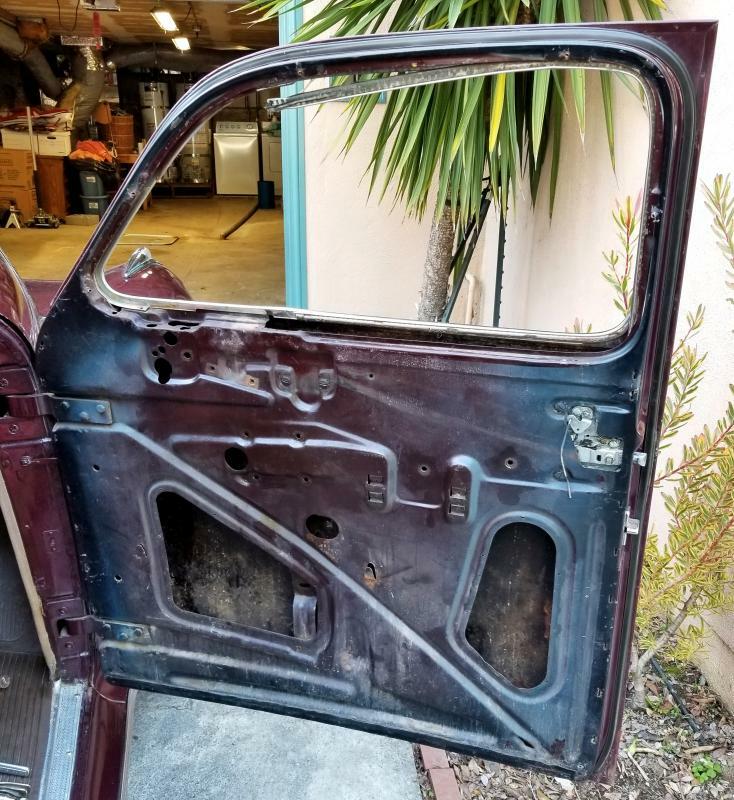 Also, I think it would be impractical to try to spray it into the doors -- it would create a huge mess and inevitably go where you didn't want it to go unless you spent a whole lot of time masking off areas with plastic sheeting, etc. Not worth the time and effort, in my opinion. I find my 41 Century pretty good in regards to noise issues. 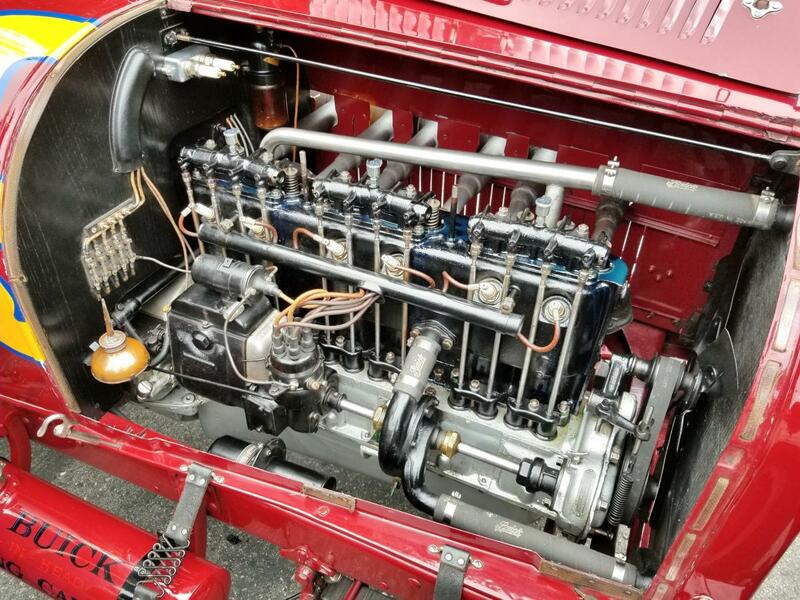 Really the first prewar car/truck I have owned where I felt insulated from the engine bay in heat sound and smell. Most of what I hear is wind hissing around windows through old track felt and the hum of the tires up through the floor which changes with road surface. Windows are right next to your ears and most of your door when closed is covered by sound absorbing seating. 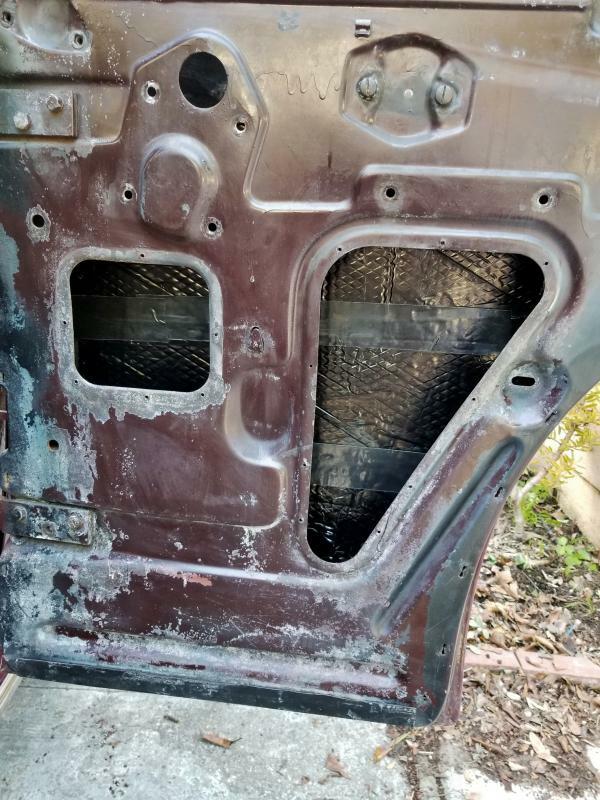 Buick has more insulation and sound absorbing interior surfaces then most and I am skeptical about improving sound deadening by lining the door panels. Insulating the floor from drive train and tire noise is always a plus. I think fresh window felt would do more to reduce cabin noise. As previously has been said once the window is open its of no value. Correct fit door rubber seal is really important and universal is not as good as the pricey Steel Rubber supplied original seal with molded corners and bottom seal . That said I am hoping to hear the effort was worthwhile. 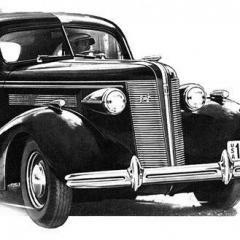 My dads old Lincoln famous for sound attenuation was so quiet you could barely hear horns from other cars. 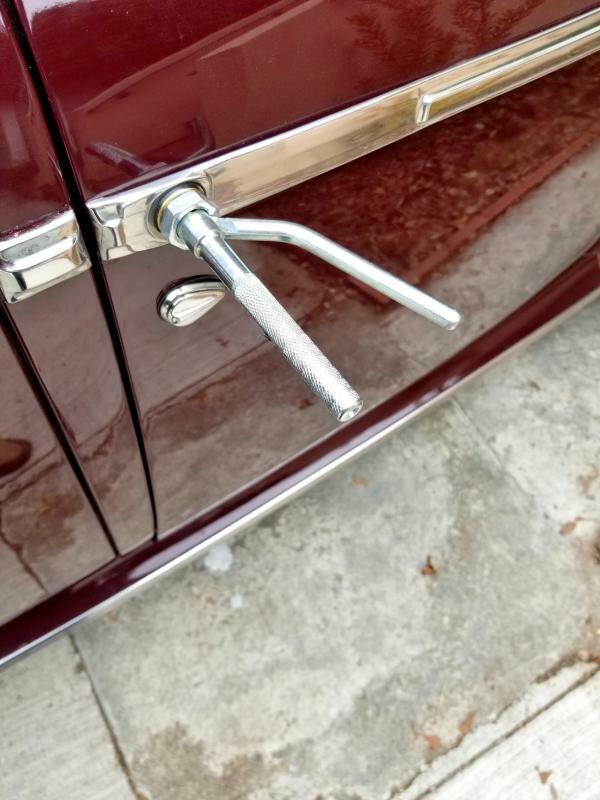 On the '41, the ferrule goes in between the door handle and the stainless trim strip. Four tweaks of the tool at 90 degree angles, and you're done. 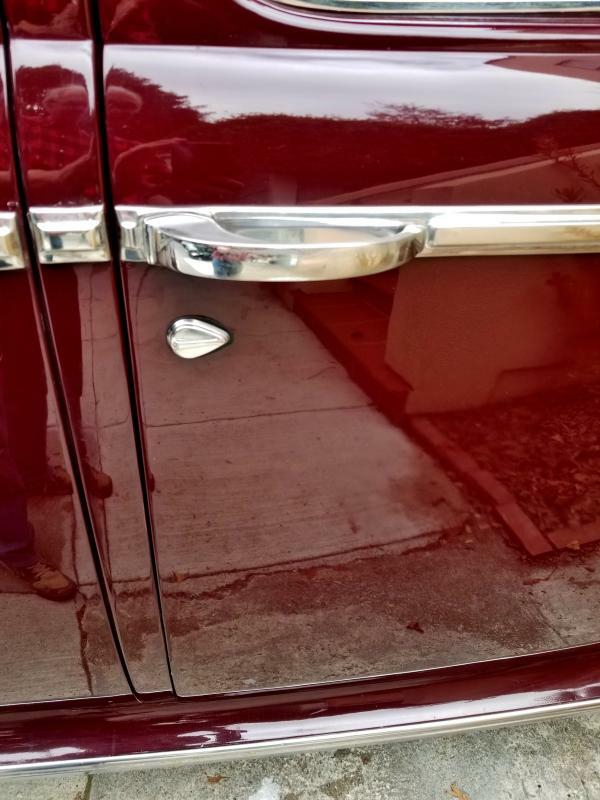 The result is a nice, tight-fitting door handle. Hooray! My heartfelt thanks to Gary -- I love the way people help each other out in this hobby! I love having an old car project going -- every day is like Christmas! 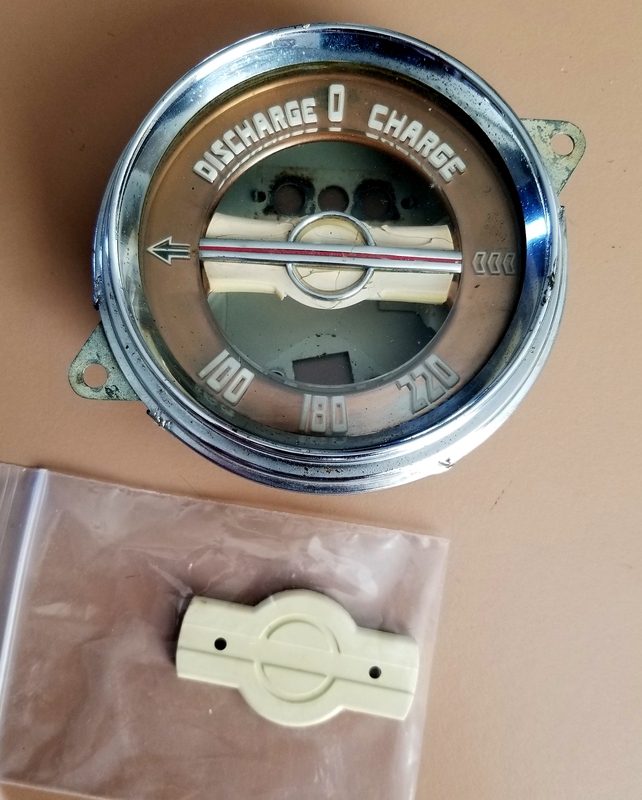 I got some things from Doug Seybold today: a vent regulator for the rear door to replace the one with the broken pot metal shaft, and a gauge housing for the temperature and battery gauges that I will be replacing. 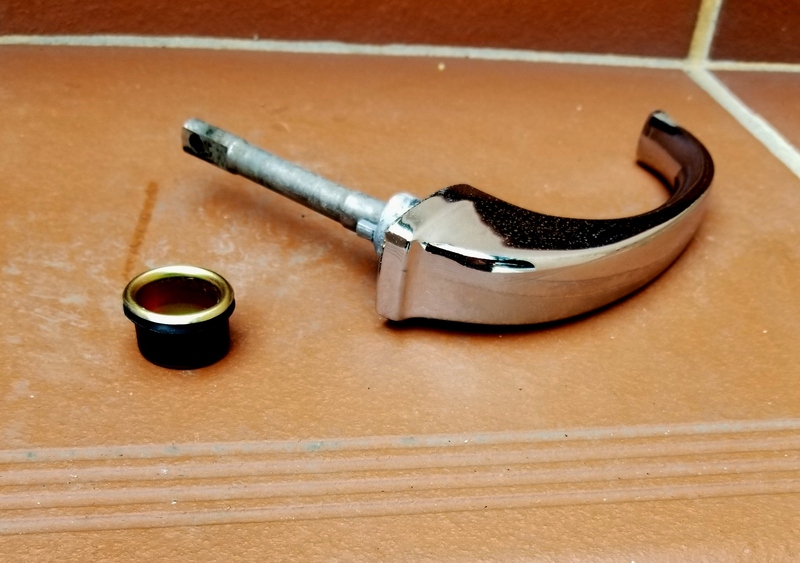 Doug also supplied a reproduction ivory plastic piece for the "bowtie" in the gauge housing. Doug was a pleasure to deal with, as was his son, Nate. They have an "old school" operation -- no email, all communications by phone. And they send the parts first, with an invoice asking that you send a check by return mail. Doug is also the designated BCA "advisor" for 40-41 cars, and seemed content to answer as many questions as I had to ask him (and I had a few). I recommend him without qualification to anyone seeking parts or information about a '40 or '41. 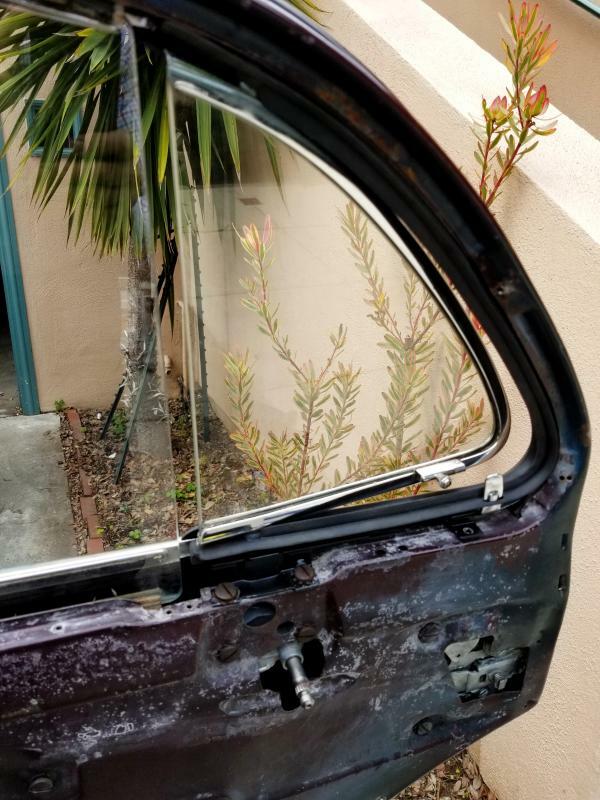 I took my car back to the East Bay this morning to see whether Gary's friend, Mike, could help get my right rear door to fit better and seal properly. Long story short -- despite Herculean efforts by Mike and an assistant, they were not able to bend the door. 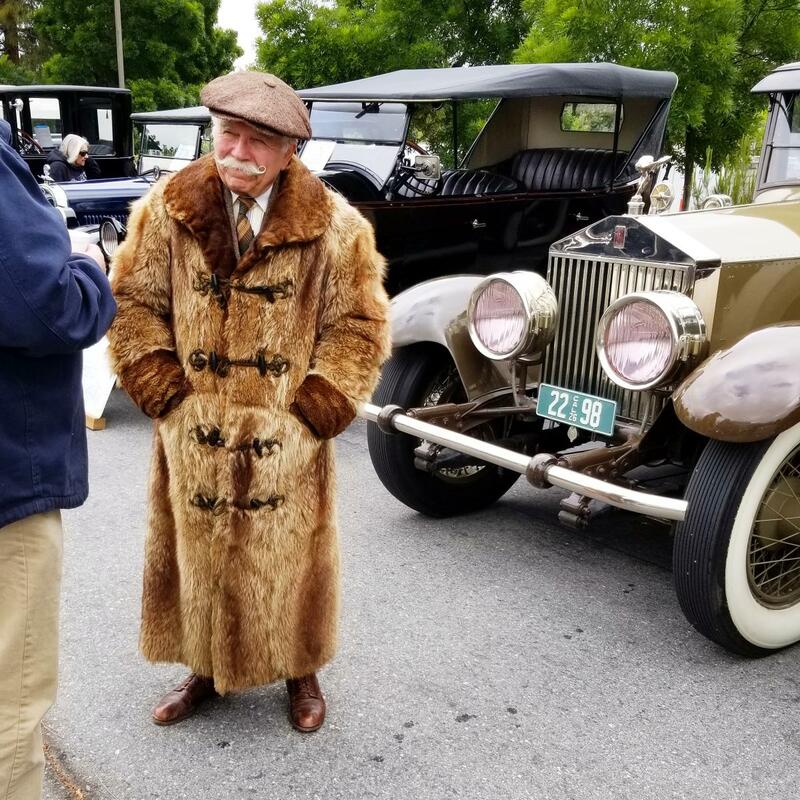 (I think they were using techniques that probably work with "modern" cars that are made of tin, but they were defeated by the thick sheet metal from Flint!) However, Mike had a good suggestion, which I was able to follow after I got back home in the afternoon. 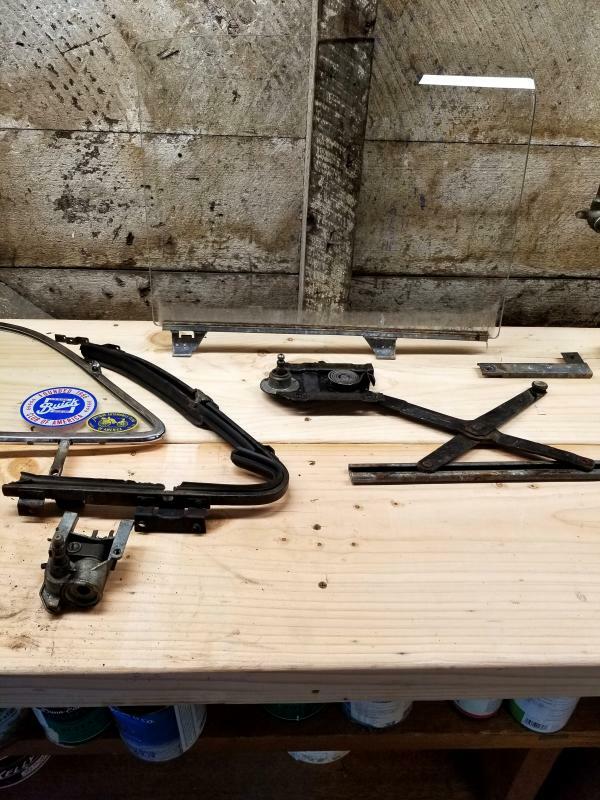 Mike suggested that I shim the lower hinge, which would push the door out a bit on the lower end and bring it in a bit at the top, where the problem is. I followed his suggestion, with great results. 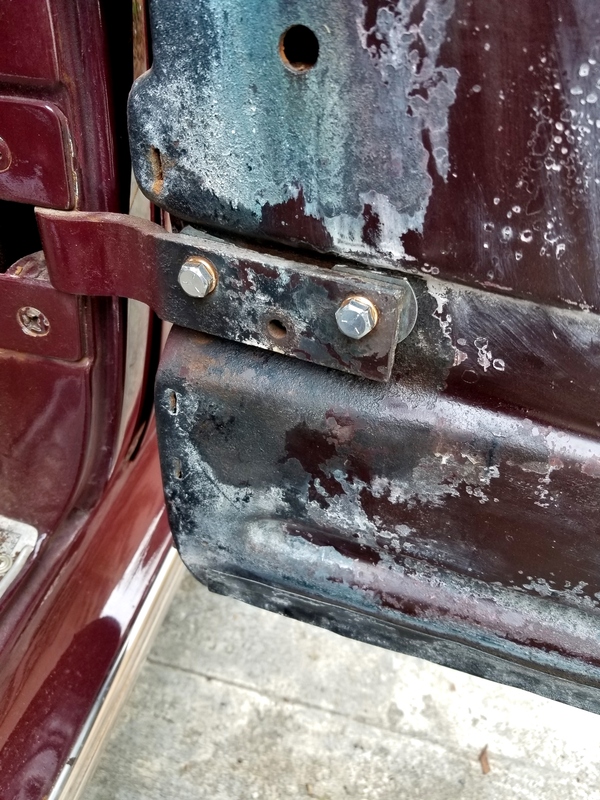 After making this change (and adjusting the latch hardware), the door was sealing at the top except for the last ten or so forward inches. Much better. I decided to just add some rubber weather strip and consider it done. As long as it looks presentable (which it does) and keeps the water out, I feel that I have met my "reliable driver" standard. 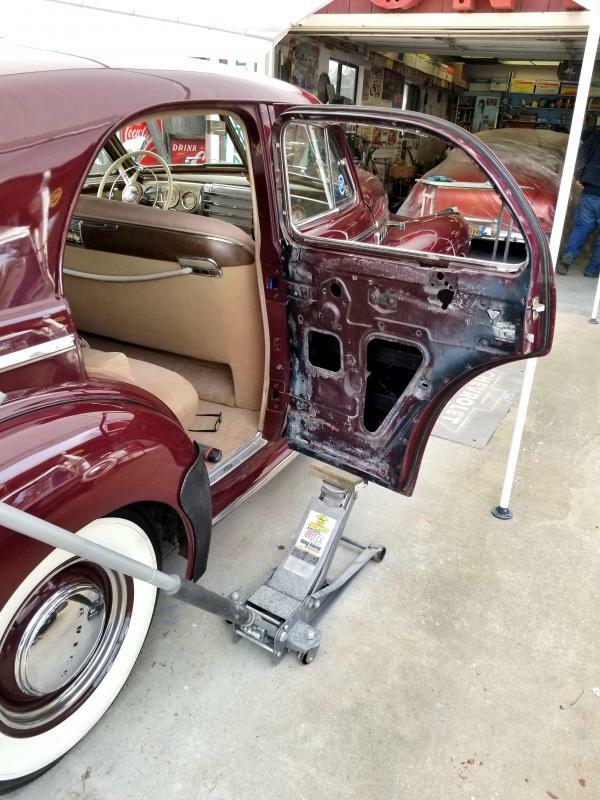 I got the right rear door all back together and sealing tight. Now time to move on to the right front. Everything had to come out so I could put the sound deadening material in. Here's what came out of the door. Pot metal shaft on the vent window regulator broken, just like the rear door. More $$ on the way to Doug Seybold! At least the old rubber wasn't rock-hard like the rear. It came out pretty easily. My car has several different brands of laminated glass (not sure what is original). 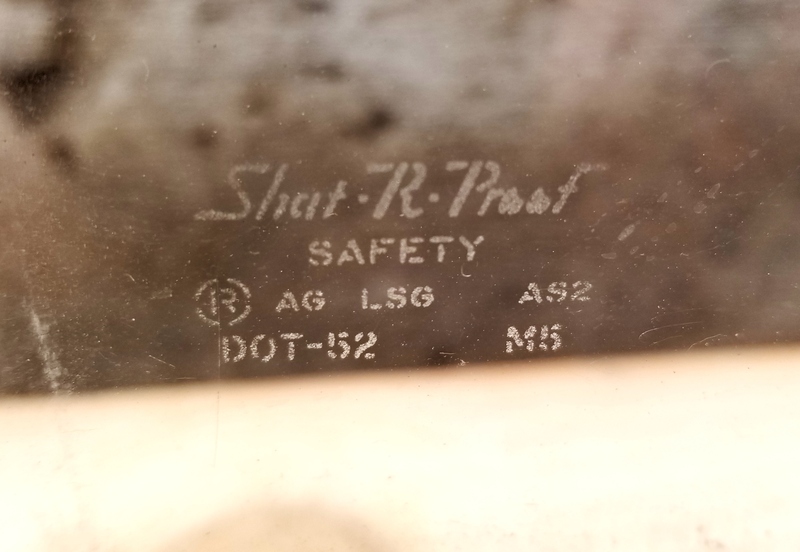 My favorite is this one "Shat-R-Proof"
I have been pretty quiet lately, just working away at various cosmetic issues, getting my doors back together, etc. 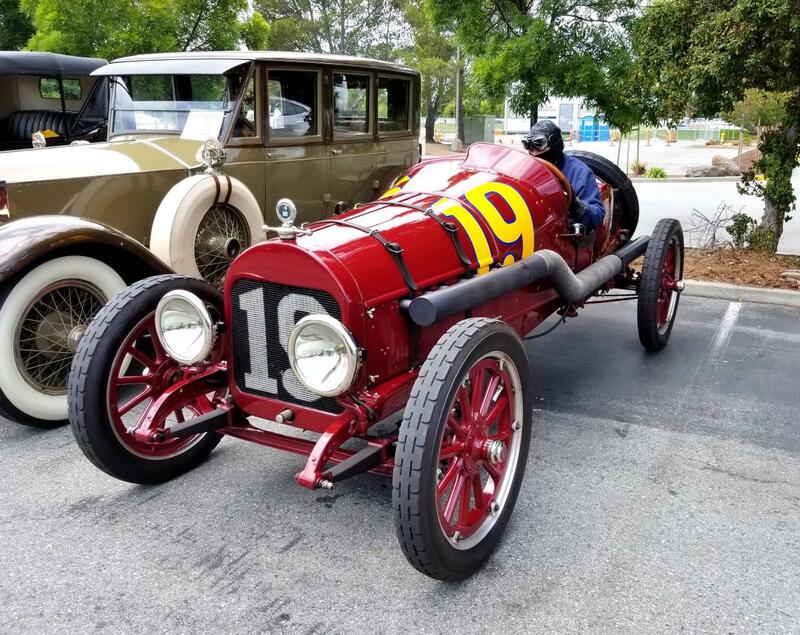 But today was my favorite old car event of the year in the Bay Area -- Friendship Day, a very informal, non-judged get together put on by the Mid Peninsula Old Time Auto Club. Here are a few pics and videos. using a chassis and running gear from a car that had been converted to a farm truck! Okay, I have been defeated by the new rules, which I don't understand. I tried to post more photos in this post, but get a message that says, "You are only allowed to upload 9.77mb." Does that mean "per day?" Anyway, I guess that's all for today. I have a lot more photos, and would welcome any help about how to get around the new rules. I'm sorry, but I refuse to take the time to make my photo files smaller or compress them. I'm sure this will be worked out. I've known Doug since my first foray into buying a '41 Buick back in 1999 or so. He has always been extremely helpful with information, encouragement, and even doing some work on my Century (pressing the kingpins out, for instance). 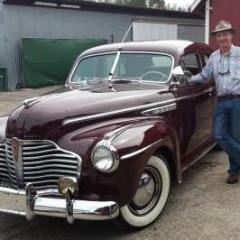 He's an invaluable resource to those of us with '40 and '41 Buicks. 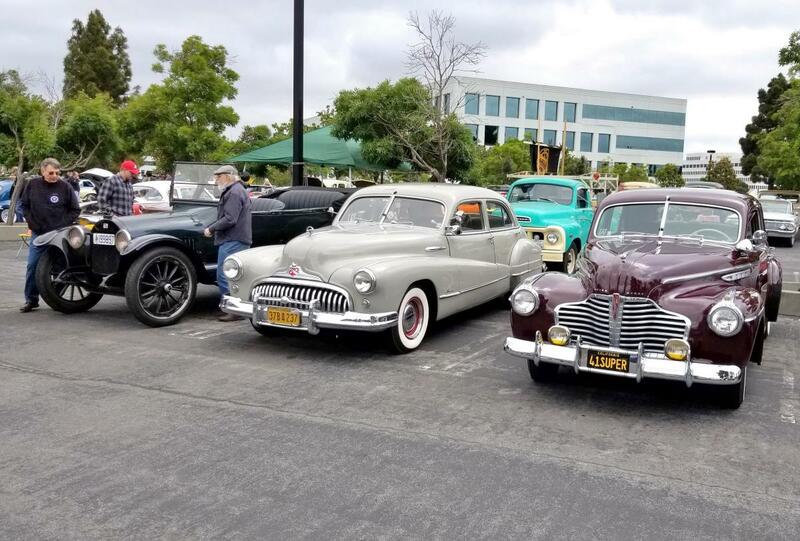 He also has a giant boneyard behind his shop full of '40 and '41 Buicks waiting to be disassembled for parts, which is presumably where your parts came from. I'm lucky enough to have him local to me, so whenever I have questions, I can just drive over and see him or Nick or Nate or a car and get an answer. In fact, Doug and I have become friends over the years and he just sent me his personal '73 Buick Centurion convertible to sell. And as much as I'd like to finish it myself, I'm thinking that sooner or later my Century will end up in his shop for finishing. I'm probably not going to have the time to do it and I'd sure like to drive it. Anyway, glad to see you have parts you need. This is a thread I always make a point of visiting to get updates. PS: Neil, I haven't taken you up on the offer of the radio button simply because I sadly sold my '41 Super convertible. Someone made me an offer I couldn't refuse and even though it broke my heart, I can't keep them all. I'll keep an eye out for a "K" for you, though! Thanks, Matt. I suppose it's a good thing that you sold your convertible, even though it must have been sad to see it go! Here's an atmospheric pic taken by a passenger on a ride around the neighborhood yesterday. 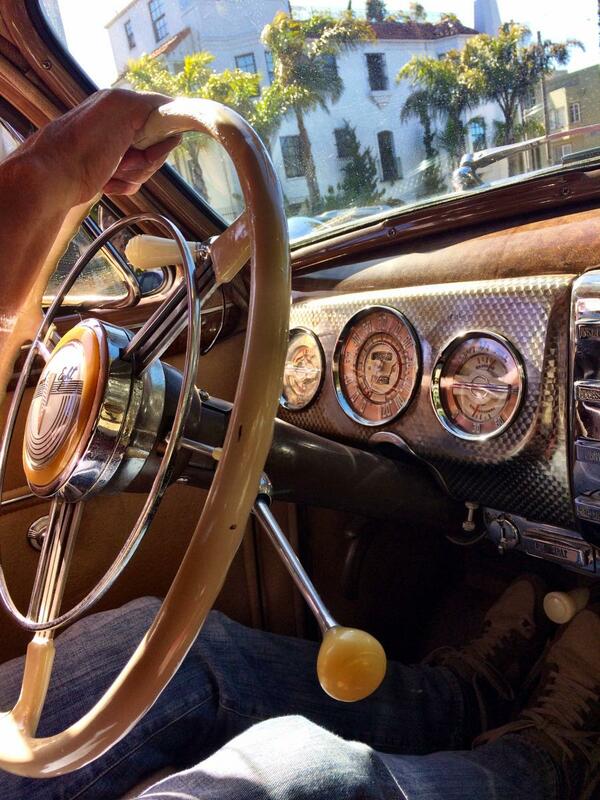 Not much to report these days -- just driving and enjoying my Buick! That's the best kind of report! There was the name of a realtor printed on the back of the card. I sent her an email and it turns out that she had hired a photographer to take some photos of the neighborhood which she had made into post cards and then handed out at an open houses. Apparently one of my neighbors who got the card recognized my car and left me the card on my windshield. Very cool! 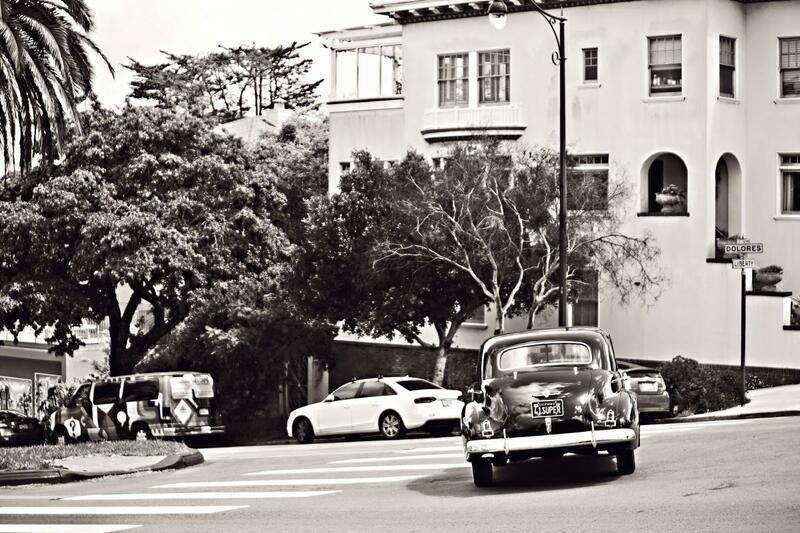 It's too bad about the contemporary vehicles in the photo -- otherwise it would look like it had been taken in the 40's. As I've commented previously, deciding how much improvement to make to a "driver" is a matter of compromises -- you don't want to let things get too shabby, but at the same time, you have to be careful what you "restore" because anything shiny and new is going to make everything around it look worse. I wasn't sure what to do about my sun visors. They were very faded on one side and consequentially a different color on the other side. 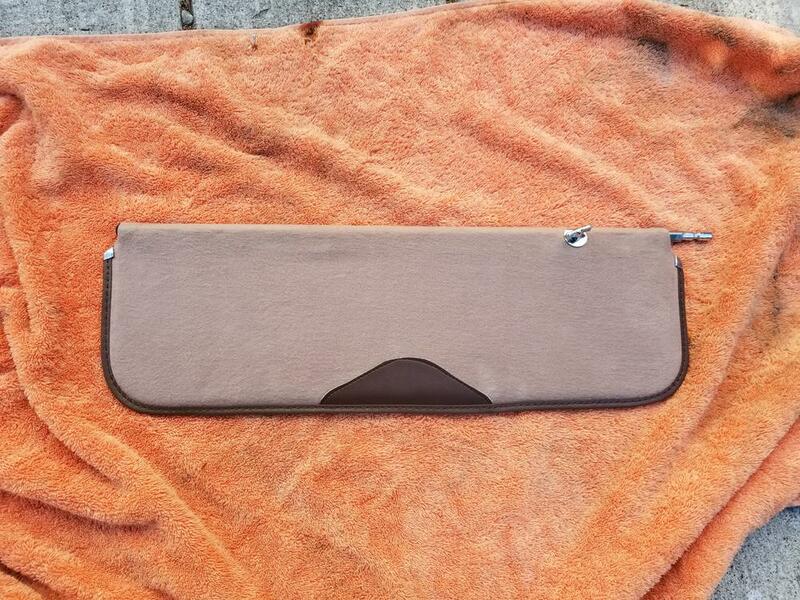 The original headliner was intact and looked pretty good, at least faded in a uniform way, so it was all the same shade. I didn't want to replace the headliner, so what about the visors? What helped me make up my mind was that the interior fiberboard panel on the driver's side was broken so the visor was no longer functional -- it was very floppy. 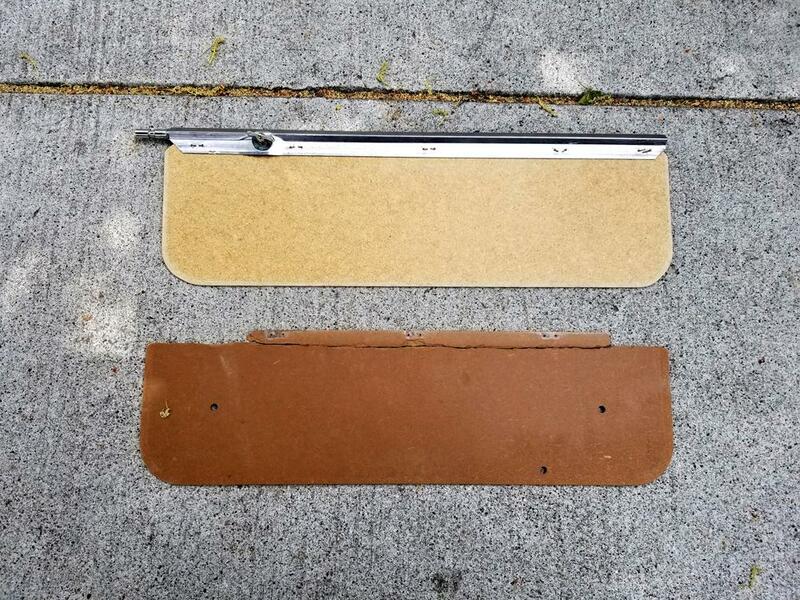 Since the visors serve an essential function when driving into the sun, I decided to go ahead and fix them up even though they wouldn't exactly match the old headliner. This pic shows how different the two sides of the visors were -- this is the "top side" of the left-hand visor and the "bottom side" of the right-hand. This shows the reconstructed "core" for the driver's side that I made from 1/8" fiberboard to replace the broken part, shown below. The refurbished visors reinstalled. So now I can drive out to the beach to watch the sunset without getting blinded! Looks great Neil, I have to do mine at some point and I very well may take your lead with the new fiber board. 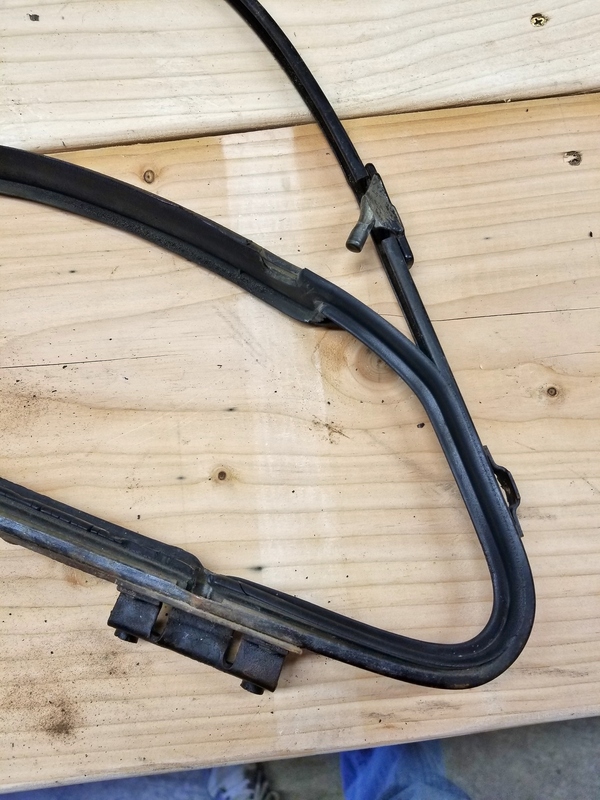 Not much going on with my car, but I'm happy to report that I found this very nice set of the missing rear fender trim on Ebay! 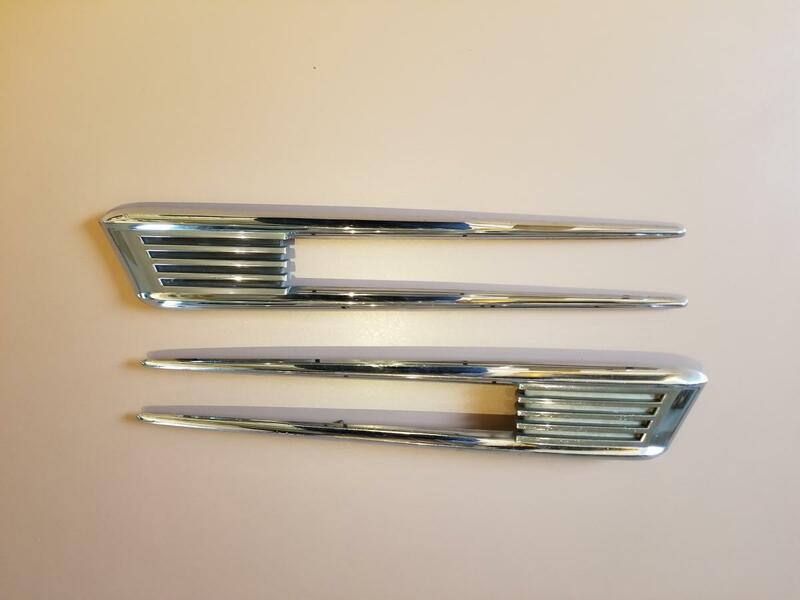 The fact that these spears were missing from my car has always bothered me because I want it to be as complete and correct as possible, but I was afraid that the pieces would be too pricey. When these came up recently at an affordable price, I jumped on it! 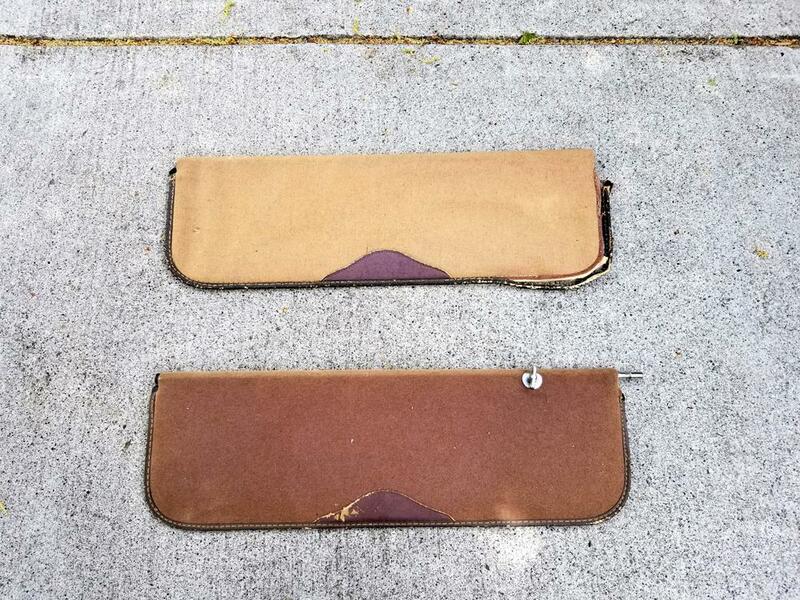 Now I just have to be verrrrry careful about measuring and drilling the holes in the right places. Neil, is there any evidence on the inside of the rear fenders where the old pieces were removed?